Aslan – This was the name of the lion in author C.S. Lewis’ highly successful book series (and subsequent movies) “The Chronicles of Narnia.” Aslan is the king of Narnia, a world of talking animals (including Aslan), mythical creatures, and great adventures for the children that venture there. Aslan is dignified, wise and compassionate, but can also be forceful and willing to fight for what is right. A male lion. 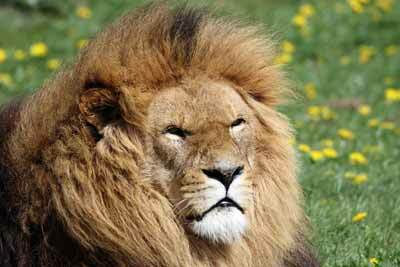 The name Aslan is associated with male lions thanks to the famous “The Chronicles of Narni” books and movies. Azrael – Azrael is a cat from the Smurf comic book, cartoons, and live action movies. The Smurfs are a group of small, blue, people-like characters who like to live peacefully in the forest. Azrael is a villainous cat who often helps his villainous human, a non-Smurf wizard named Gargamel who hates the Smurfs and wants to destroy (or eat) them. Bagheera – In novelist Rudyard Kipling’s famous books “Jungle Book,” “The Second Jungle Book,” and subsequent movie, Bagheera is a black panther. He befriends the orphaned child Mowgli, who was found in the jungle and is being raised by wolves. Bageera becomes Mowgil’s friend and protector. 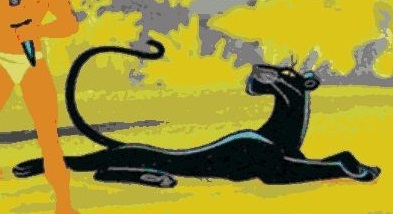 Bagheera as seen in an animated Soviet movie “Adventures of Mowgli” and reproduced on a Russian postal stamp. Mr. Bigglesworth – In the “Austin Powers” movie series Mr. Bigglesworth was the hairy, then hairless, cat belonging to Douglas Powers. 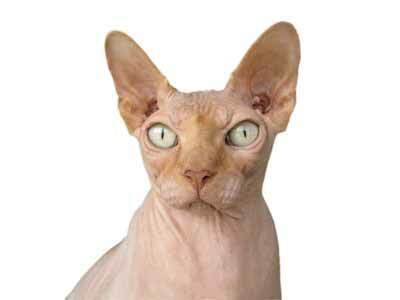 Mr. Bigglesworth originally had a lot of hair and was played by a white Persian, but after an unfortunate mishap he lost his hair, and was subsequently portrayed by a Sphynx, a nearly hairless breed. A Sphinx cat, a nearly hairless breed. Binx – In the 1993 movie “Hocus Pocus,” Thackery Binx was a young boy turned into an immortal black cat thanks to a spell cast on him by three witches. Throughout the movie Binx, the human-turned-cat, proves himself to be brave, loyal, and loving. At the end of the movie the spell is broken, and Thackery Binx the cat becomes human again and dies a peaceful and happy death. Crookshanks – In the fantasy “Harry Potter” book series that heavily features witches, wizards, and magic, Crookshanks is the cat belonging to young Hermione Granger, a friend of the title character Harry Potter. The famous, fictional, Crookshanks is half Kneazle, a type of magical feline that just happens to look a lot like a cat. He is exceptionally intelligent with a gift for sensing suspiciousness and dishonesty in people. Crookshanks shows up for the first time in the book “Harry Potter and the Prisoner of Azkaban,” the third book in the series. 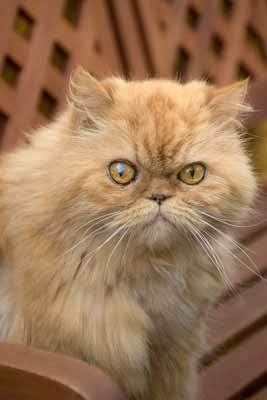 He is portrayed in the movies by a red Persian. DC – In the 1965 Disney movie “That Darn Cat!” DC (short for “Darn Cat”) is a Siamese cat who lives with two young sisters, Pattie and Inkie. When DC comes home one day with a watch around the neck inscribed with the word “help,” Patti reports it to the FBI. An FBI agent then follows, or tries to follow, DC on his ramblings in hopes he will lead them to the source of the plea for help. “That Darn Cat!” is a light-hearted comedy and all ends well for DC and his human friends. 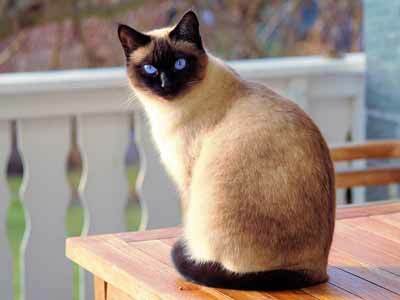 A Siamese cat showing characteristic Siamese coloring and almond-shaped blue eyes. 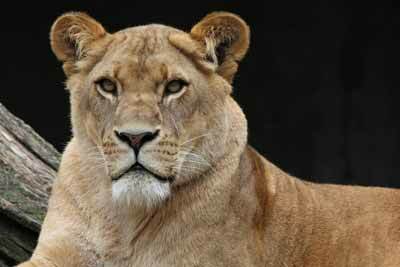 Elsa – Elsa was the name of an African lioness that was orphaned at a young age. After losing their mother Elsa and her two sisters were raised by game warden George Adamson and his wife Joy. When the young lionesses began to mature Elsa’s two sisters found homes in a zoo, but Joy adamantly insisted the she and George attempt to rehabilitate Elsa to a life in the wild. They were successful, and Joy chronicled the story in three highly successful books: “Born Free,” 1960; “Living Free,” 1961; and “Forever Free,” 1962. The successful books spawned a 1966 movie also titled “Born Free” along with a song of the same name. A lioness. Elsa was a famous lioness raised by people but successfully rehabilitated to life in the wild. Figaro – First introduced to audiences in the 1940 animated Disney movie “Pinocchio,” Figaro is the perpetually cute black cat with white mittens, a wide white chest, and a white-tipped tail. Even though his character took a back seat to the main characters of the movie, Figaro the adorable feline was loved by audiences. This didn’t go unrecognized by the Disney studio, and Figaro soon found his way into other Disney animations, including his own series of cartoon shorts. 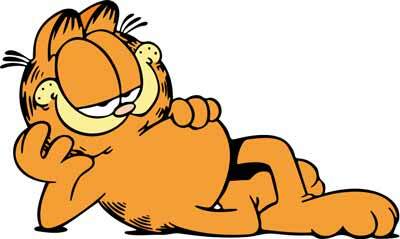 Garfield – The creation of cartoonist Jim Davis, Garfield is a plump, orange tabby cartoon cat who is the lead character in the comic strip “Garfield”. The strip usually centers around Garfield, his owner Jon, and Jon’s other pet, a not-too-bright, enthusiastic dog named Odie. The comic strip often uses recurring themes of Garfield’s love of food, laziness, and the delight he takes in treating Jon and Odie with sarcasm. The comic strip is highly popular, syndicated world wide, and has led to several animated screen projects. General Sterling Price – This was the name of the cat in the 1968 adventure-filled book “True Grit” written by author Charles Portis. The following year actor John Wayne starred in a movie of the same name, and the feline character General Sterling Price also appeared in the movie as an orange tabby. He has a decidedly small role in the book and film, but he was, and still is, popular with fans. Presumably General Sterling Price, the book and movie cat, was named after General Sterling Price (1809 – 1867), a real (human) American General who served in several wars. Jock – Jock was the name of a cat owned by Sir Winston Churchill (1874-1965), the British statesman and military leader. Churchill was known to have loved and enjoyed several cats throughout his life, and was given an orange tabby on his 88th birthday from Sir John ‘Jock’ Colville, a friend and one of his private secretaries. Churchill named the new cat Jock after his friend’s nickname. 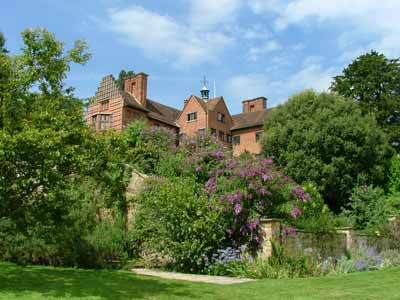 After Churchill’s death in 1965 at age 90, the National Trust took possession of Churchill’s country home, Chartwell. At the request of Churchill’s family, Chartwell has had an orange tabby named Jock in residence ever since. Chartwell, the home of Winston Churchill and several of his cats, including Jock. Lucifer – In the 1950 animated Disney film “Cinderalla,” Lucifer is a wicked, arrogant cat who loves to eat mice. He’s mostly black with a sneering smile, and his upturned eyes are often in an evil squint. In his defense, though, it’s probably difficult to be a nice kitty when you have the same name as one of the most common names used for the devil. Milo – This is the name of the nosy, curious kitten in the 1986 movie “Milo and Otis.” The adorable but curious Milo accidentally floats away in a box down a river, followed by his worried and faithful friend Otis the Pug puppy. They have many adventures in their wanderings before the movie concludes with a happy ending for both of them. Morris – Known as “the world’s most finicky cat,” Morris was the feline representative of 9Lives cat food for many years, appearing on the packaging and in television commercials. Morris was an orange tabby who first landed the role as the 9Lives model and feline actor in the late 1960s. He became quite famous, quickly becoming a household name and a favorite of the media. When the original Morris died in 1978 (there have been several Morris’ over the years) at the age of 17 his obituary appeared in newspapers all over the world. Penelope Pussycat – In the classic Warner Brothers cartoons, the amorous skunk Peppy Le Pew is often seen chasing after his love interest, a lovely black-and-white cat. While she originally went without a name, she was eventually referred to in one of the cartoons as Penelope. In later cartoons she was occasionally referred to by other names, but Penelope, or Penelope Pussycat, is the name most remembered by fans. Salem Saberhagen – In the “Archie Comics” comic books Salem Saberhagen is a talking black cat who, in an earlier life when he was a human warlock, tried to take over the world. As punishment, the Witch’s Council turned him into a black cat. Salem is good friends with the young half-witch, half-mortal girl named Sabrina and lives with Sabrina and her two aunts. When the comic book characters were turned into a popular live-action television show titled “Sabrina The Teenage Witch” Salem was alternately portrayed by a real black cat(s), and an animatronic one. Scratchy – In the long-running Fox Network animated cartoon series “The Simpsons,” young Bart Simpson loves watching an animated cartoon series (yes, a cartoon within a cartoon) titled “The Itchy and Scratchy Show.” In the show Itchy, a mouse, and Scratchy, a cat, are extremely violent towards one another, with lots of gore included in every episode. 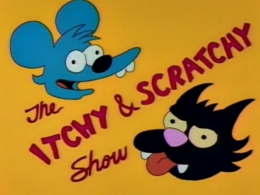 Scratchy is a mangy-looking black cat who isn’t very bright, and he’s repeatedly on the receiving end of Itchy’s cruel attacks. Even though Itchy has been repeatedly killed in the cartoons, he somehow magically reappears to co-star with Itchy in the next episode. Shere Khan – In novelist Rudyard Kipling’s books “Jungle Book,” “The Second Jungle Book,” and subsequent movie, Shere Khan is another feline character. Unlike Bagheera, the black panther, Shere Khan is a tiger. Also unlike Bagheera, Shere Khan is wicked, and hates the human child Mowgli. Is spite of his evil heart and treachery Shere Khan is never able to kill Mowgli, who gets the best of the tiger in the end. 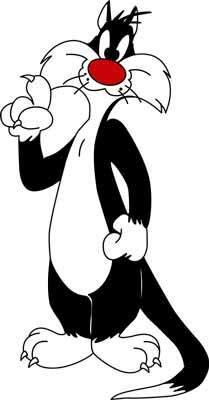 Sylvester – In the “Loony Tune” animated cartoon series Sylvester was a talking black-and-white cat. He was known speaking with a wet, often slobbery lisp, and for exclaiming “Sufferin’ succotash!” when he was surprised or frustrated. He was fond of chasing a small yellow bird named Tweety Pie. Sylvester would occasionally actually to catch Tweety, but somehow never managed to harm the clever little bird. Thomasina – This cat name is famous from the 1963 Disney movie (based on the book of the same name) the “Three Lives of Thomasina.” Set in 1912 in Scotland, the movie features Thomasina (on orange tabby), her seven-year-old owner, Mary, and the love they have for each other. The film has several heart-tugging moments as it deals with the struggles Mary has in the relationship with her father, and Mary’s broken heart after her beloved Thomasina dies. However, it turns out that while Thomasina may have died she only lost the first of her nine lives, and she is ultimately reunited with the little girl who loves her. Little kids – and some grownups – might bawl their eyes out during this movie (it is made by Disney, after all, the same people who so gut-wrenchingly killed Old Yeller) but the ending is a happy one. Tigger – The tiger named Tigger is a perpetually happy, bouncing tiger from the “Winnie The Pooh” books and animated cartoons. He is friendly, fun, energetic, and over confident in a cute sort of way. Tigger is friends with Winnie-the-Pooh, the live Teddy bear who is the main character of the “Winnie The Pooh” stories.